Get a sense of the local culture at Hastings Street and Noosa Museum. You'll find plenty of places to visit near Noosa: Chenrezig Institute (in Eudlo), Caloundra (Spinners Bar and Bowl, Downtown Caloundra, & more) and Maleny (Maleny Golf Club, Art on Cairncross, & more). Spend the 27th (Sat) exploring nature at Glass House Mountains National Park. Spend the 29th (Mon) exploring nature at Conondale National Park. 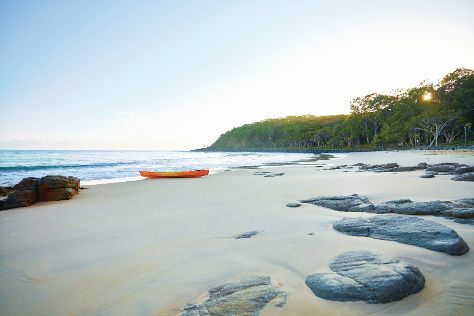 There's lots more to do: explore the striking landscape of Noosa National Park, take in the exciting artwork at Atrium Gallery at Buderim Craft Cottage, tour the pleasant surroundings at Mooloolaba Beach, and explore the galleries of Artisans Gallery. To see other places to visit, ratings, photos, and other tourist information, use the Noosa travel planning tool .